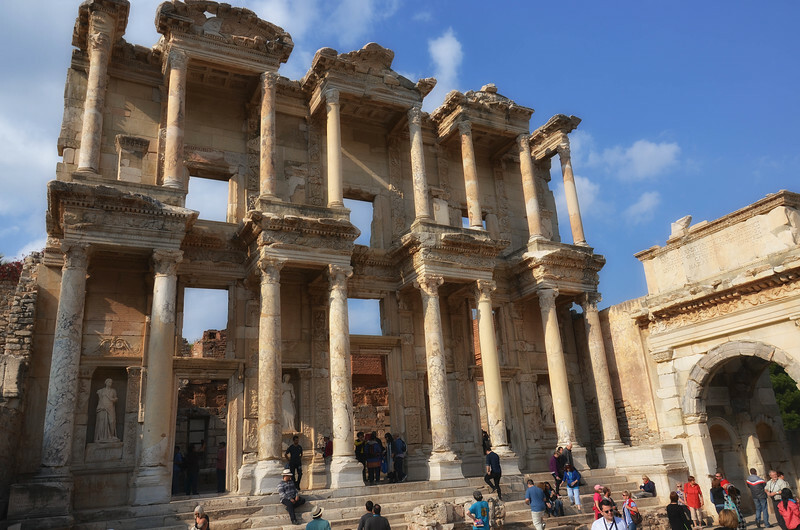 On Thursday, November 15, 2012, we hopped a short Turkish Airlines flight down to Izmir, and rented a car to visit the ruins of the city of Ephesus. 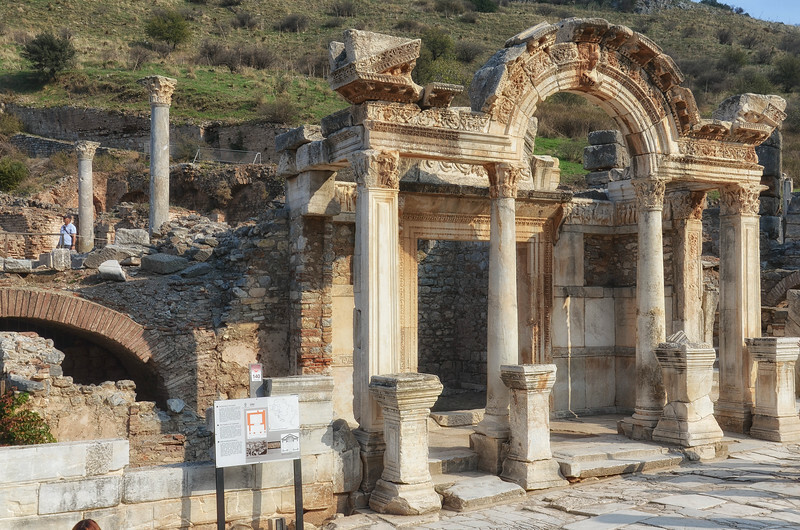 Located near the present-day Turkish town of Selçuk, Ephesus is the site of an ancient city initially established by the Greeks, and later annexed by the Romans. 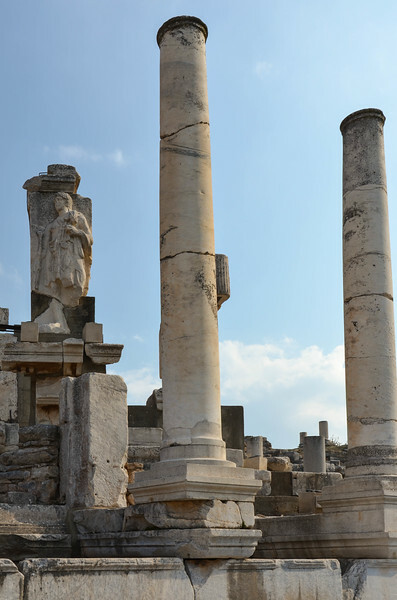 Its population peaked at over 250,000 in the first century BC, but due to a silted-in harbor and devastating earthquake in 614 AD, Ephesus fell into decline. 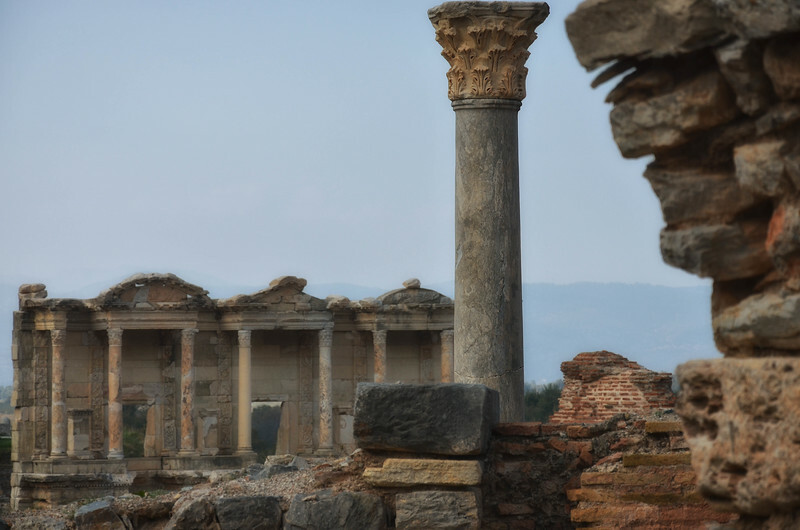 By 1090, it was just a small village, and by the 15th century AD, it was largely abandoned and forgotten. 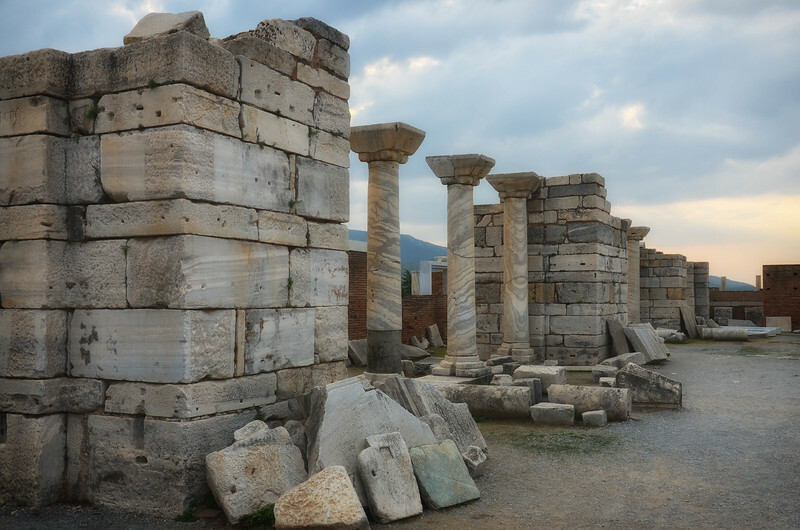 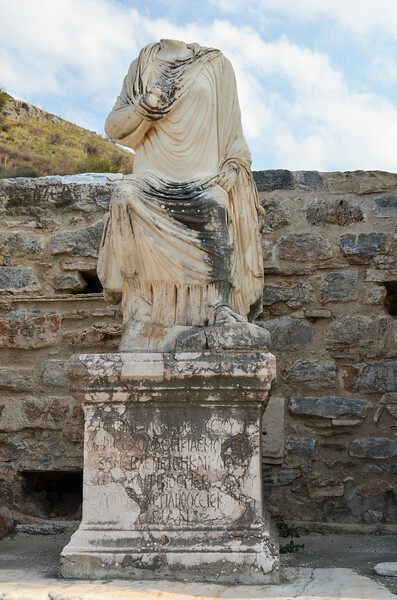 Today Ephesus is best known for its prominence in Biblical writings and association with important early Christian figures, as well as its excavated ruins. 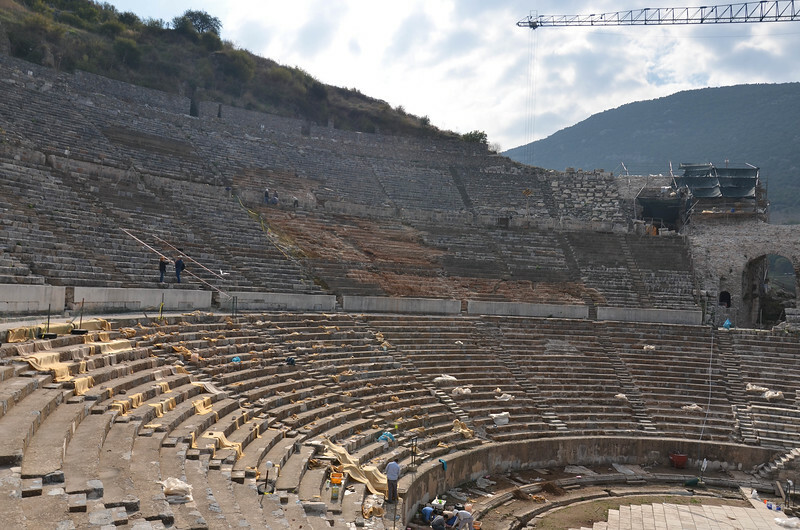 The amphitheatre in Ephesus, which could seat around 25,000 people. 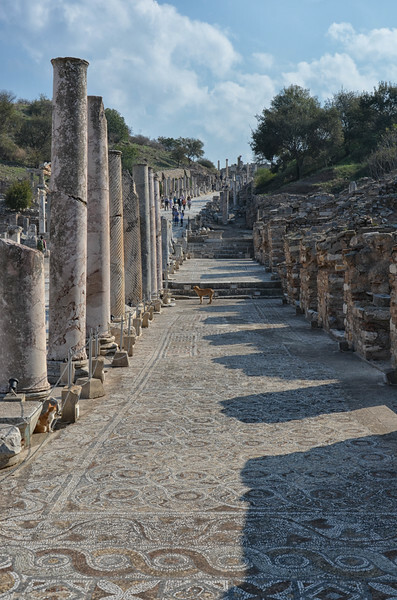 This street once led from the Theatre to the harbor at Ephesus. 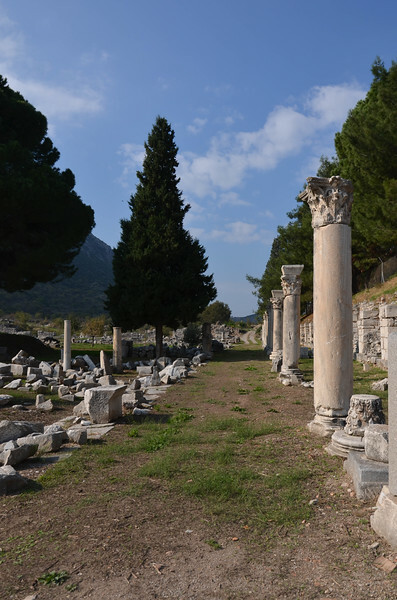 Today it leads to a grassy meadow where the bay once was. 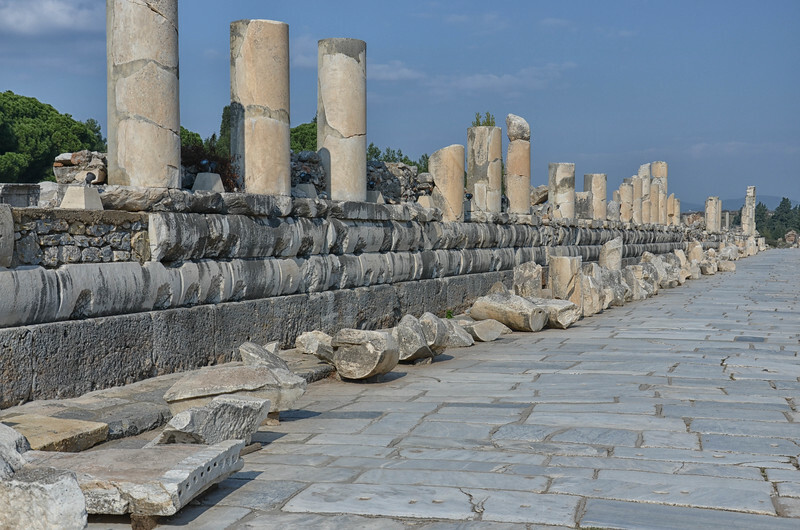 The street leading away from the Theatre toward the former harbor. 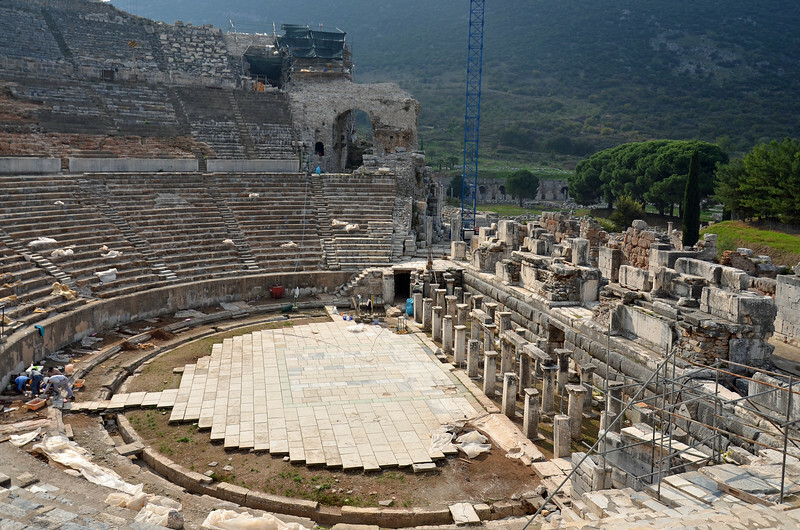 Inside the Theatre at Ephesus. 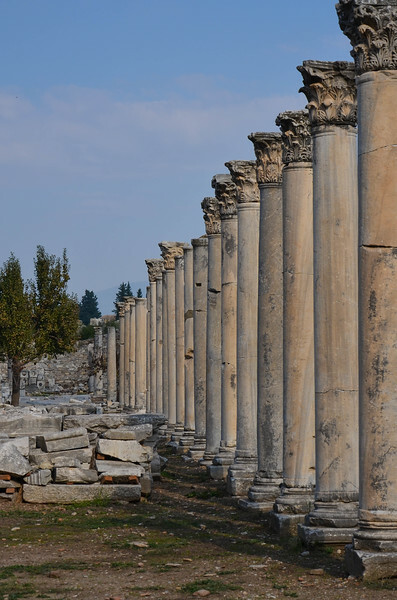 Extensive resotration work was going on at the time of our visit. 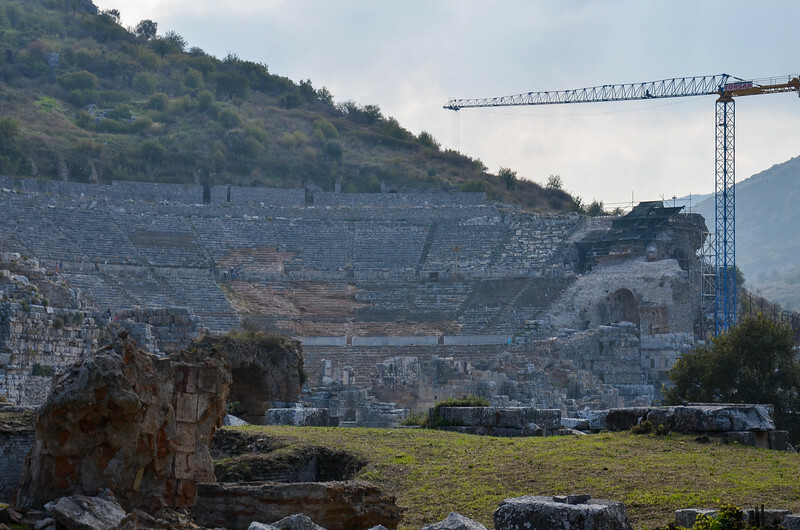 The massive theatre at Ephesus. 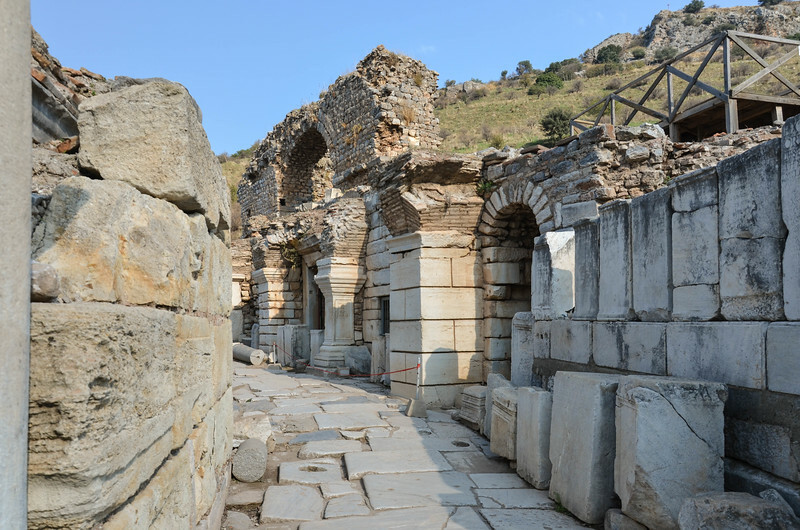 One of the former streets in Ephesus. 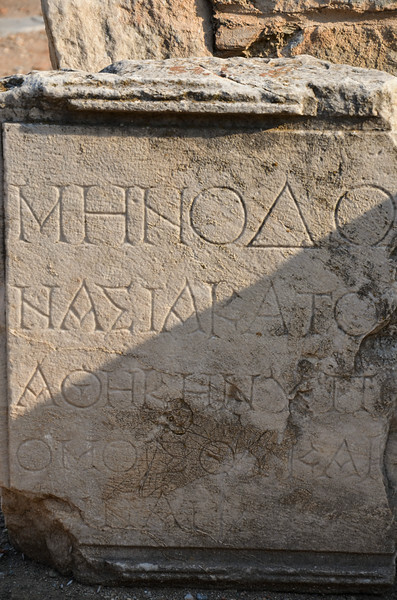 An inscription on the wall inside the Library of Celsus. 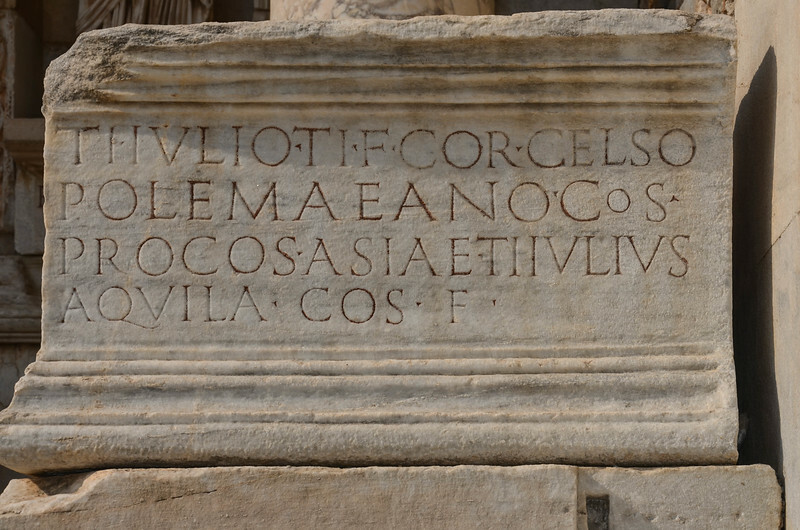 A inscription on the Library of Celsus. 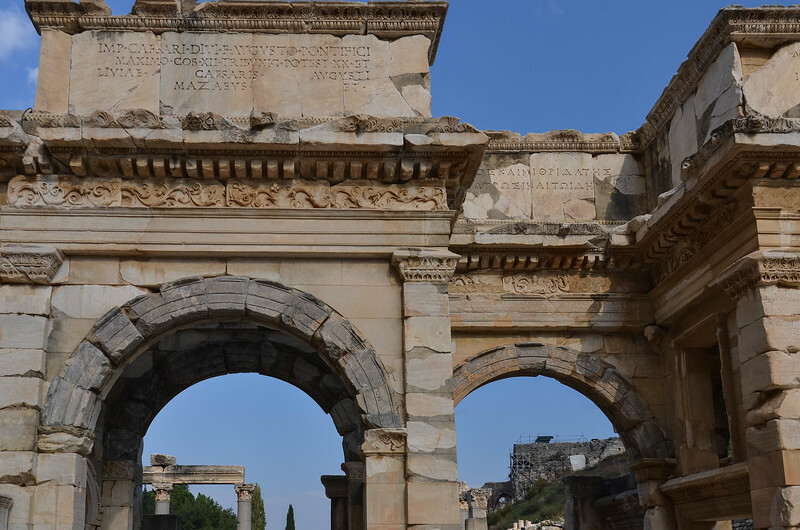 The Gate of Augustus, adjacent to the Library of Celsus, in Ephesus. 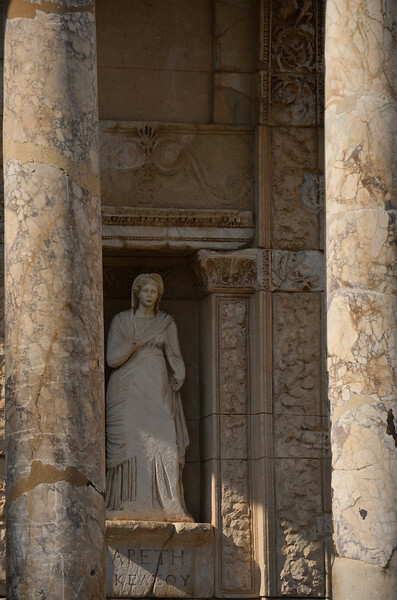 The restored marble façade of the Library of Celsus. 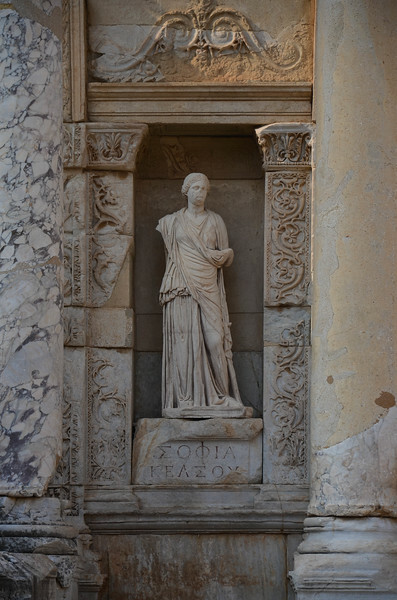 A statue on the façade of the Library of Celsus. 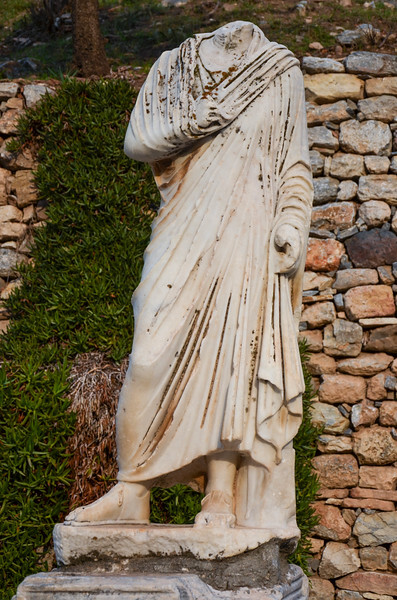 Statue on the front of the Library of Celsus. 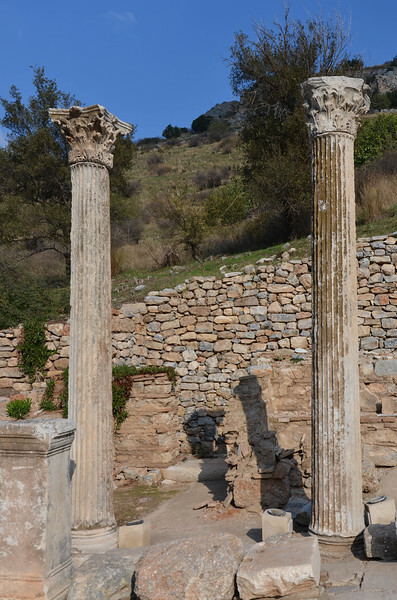 A building façade in Ephesus. 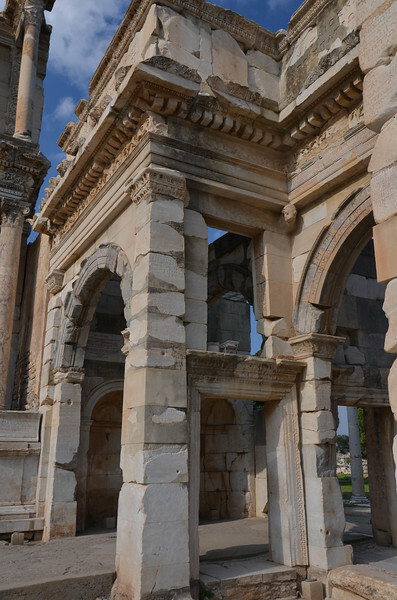 The restored façade of the Library of Celsus. 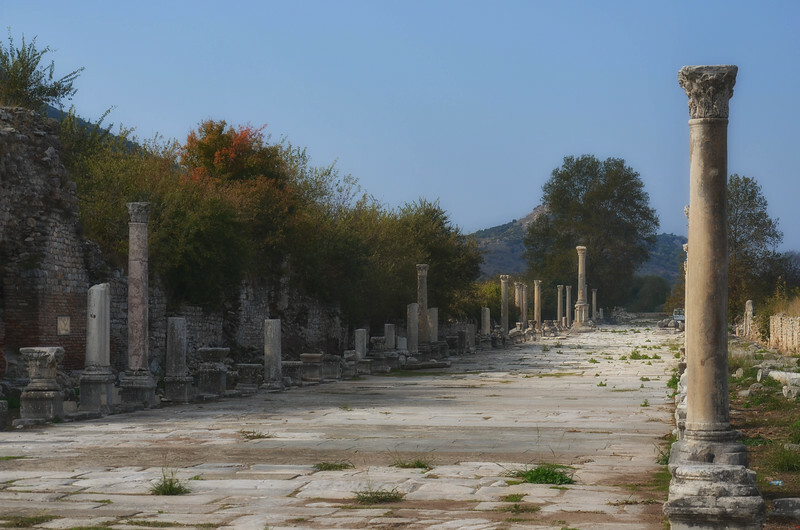 The main street through Ephesus. 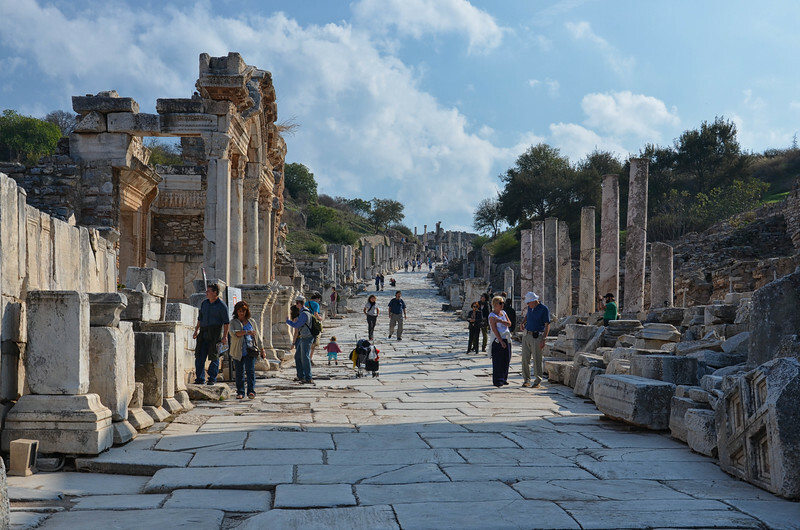 The main street in Ephesus. 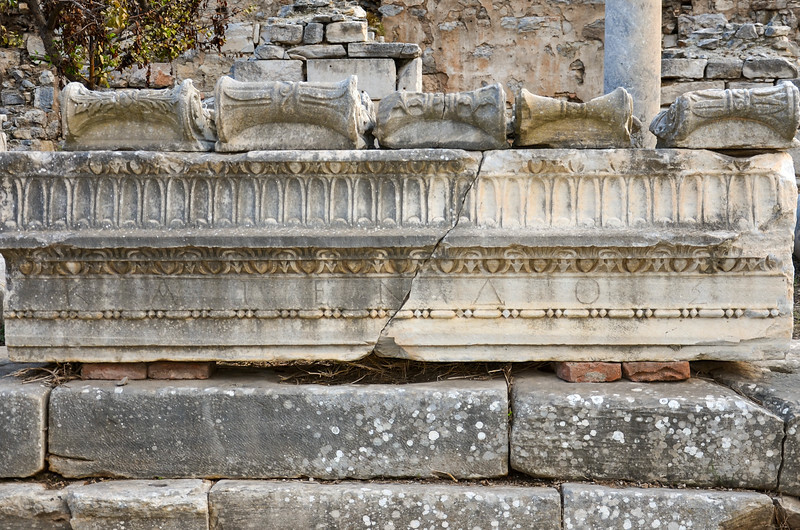 Mosaic floors dating back over 2,000 years are found throughout the Ephesus site. 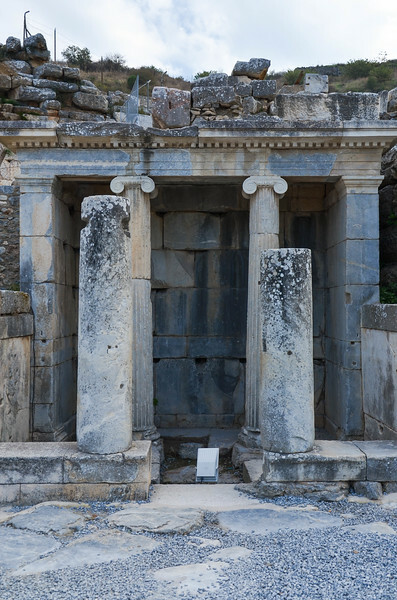 The façade of the Temple of Hadrian in Ephesus. 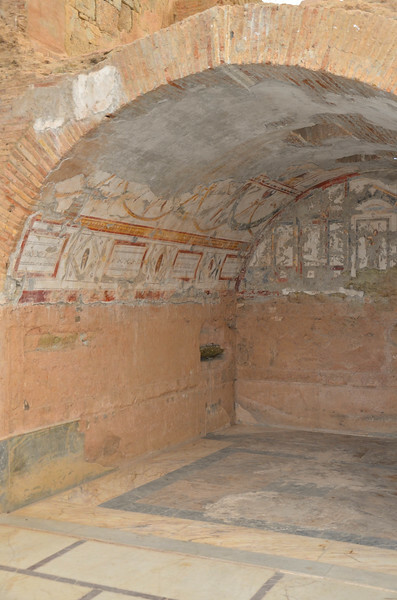 A vaulted ceiling with original paint and a mosaic floor inside the terrace house complex in Ephesus. 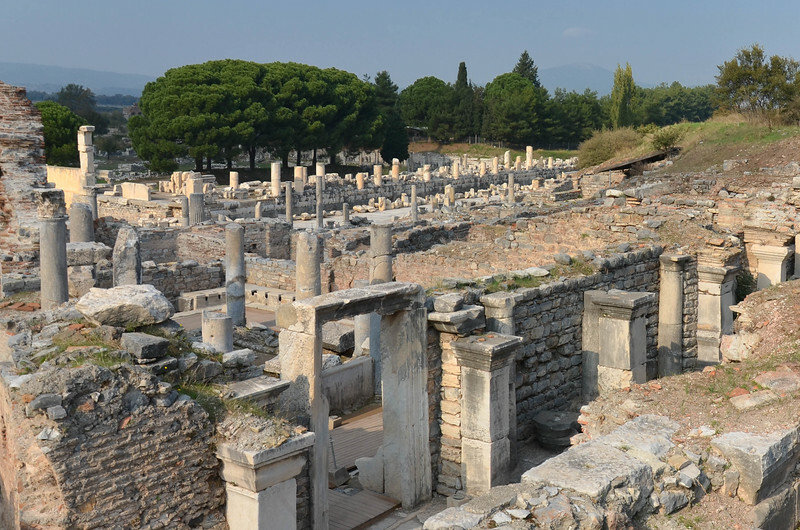 These houses date from 100 BC-700 AD. 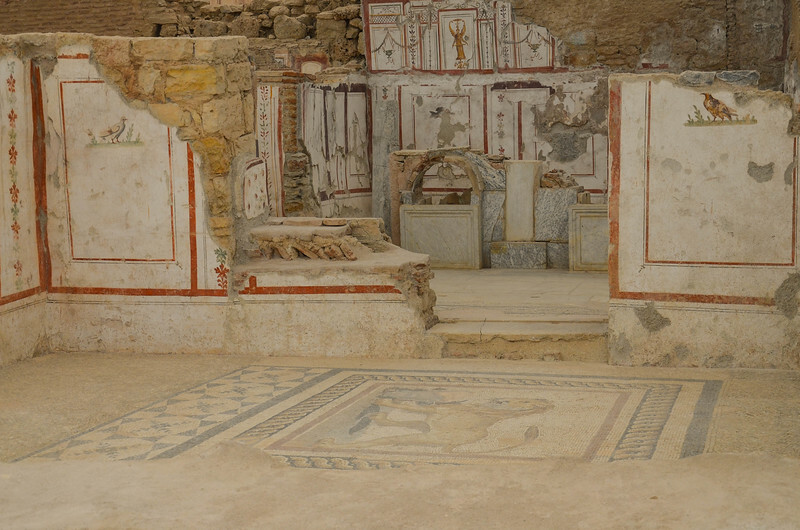 Painted walls with pictures of animals, plants, and birds, and a lion mosaic in the floor of this house are remarkably well preserved. 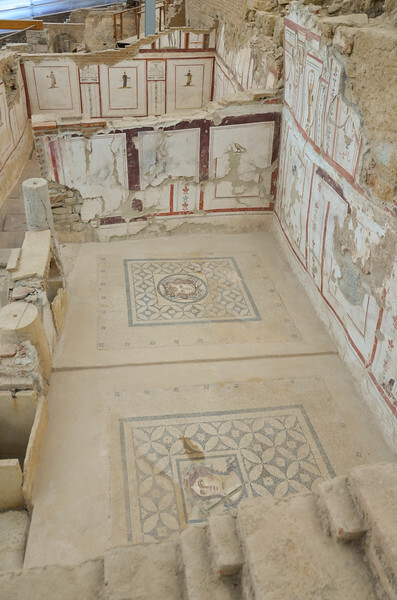 More wall paint and mosaics in one of the terrace houses. 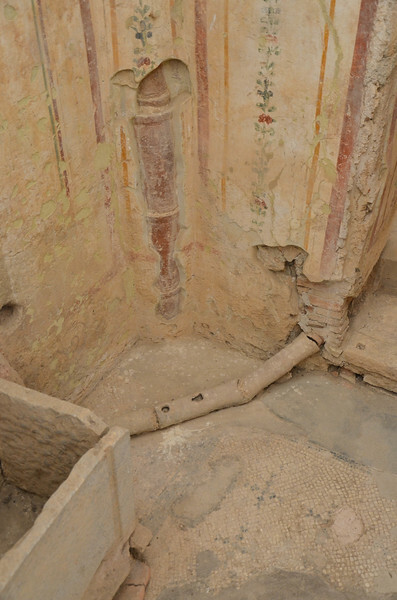 Water pipes within the walls and floors of one of the terrace houses. 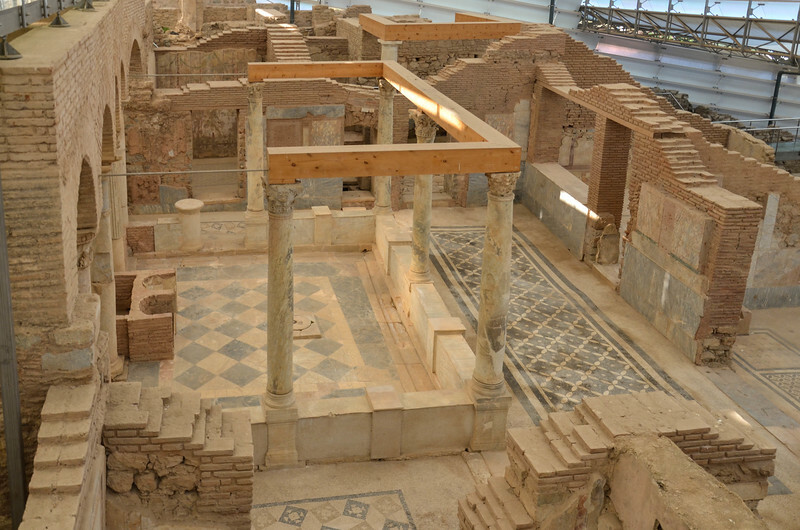 These houses were equipped with running water for drinking and sanitation, and used heated water pumped under the floors to generate heat in cold weather. 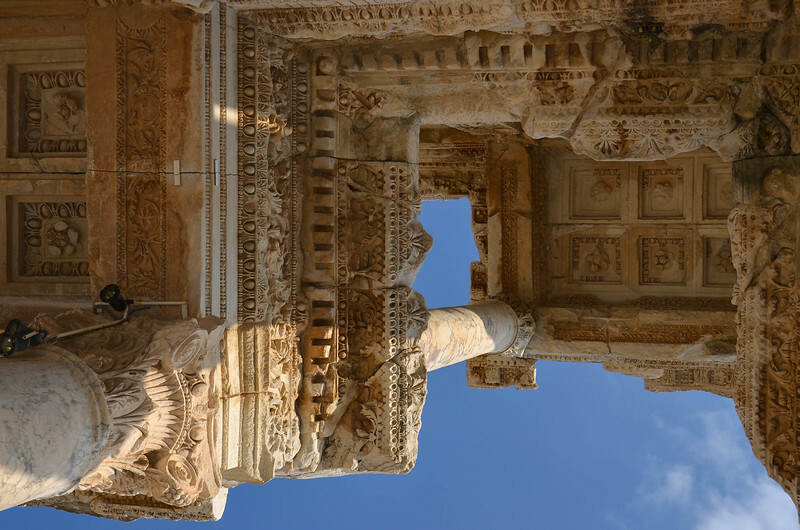 The façade of the Library of Celsus. 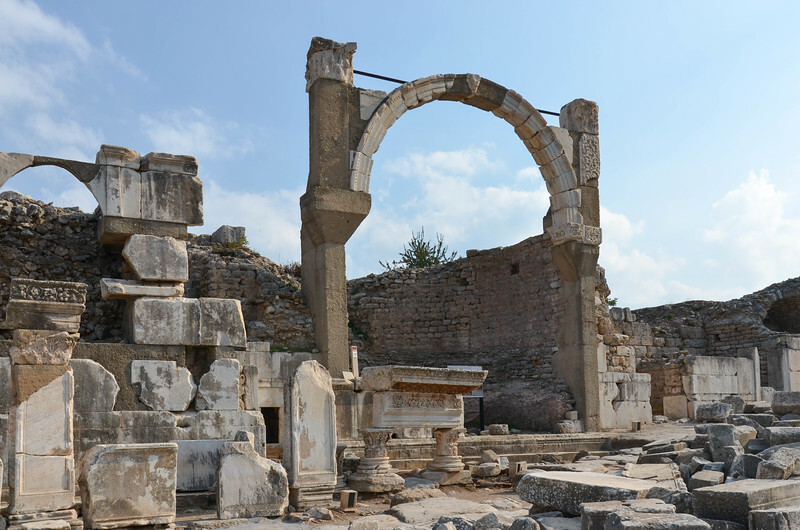 Ruins of the Baths of Scholastica. 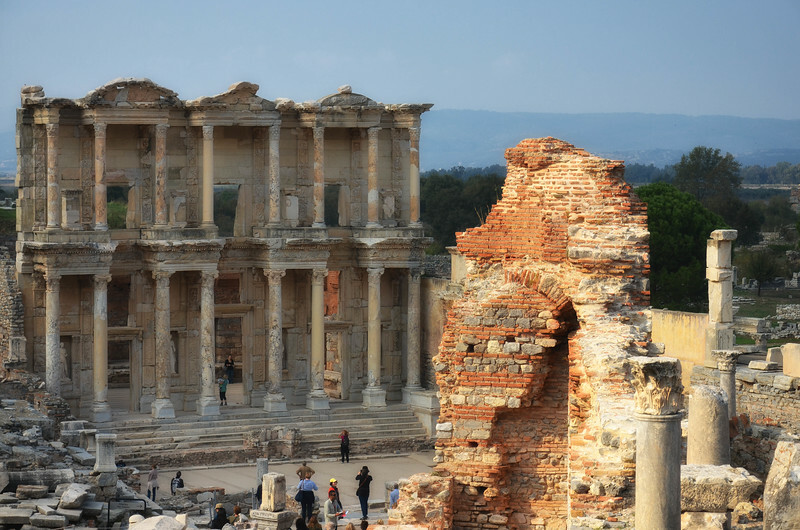 A view of the Library of Celsus from the Baths of Scholastica. 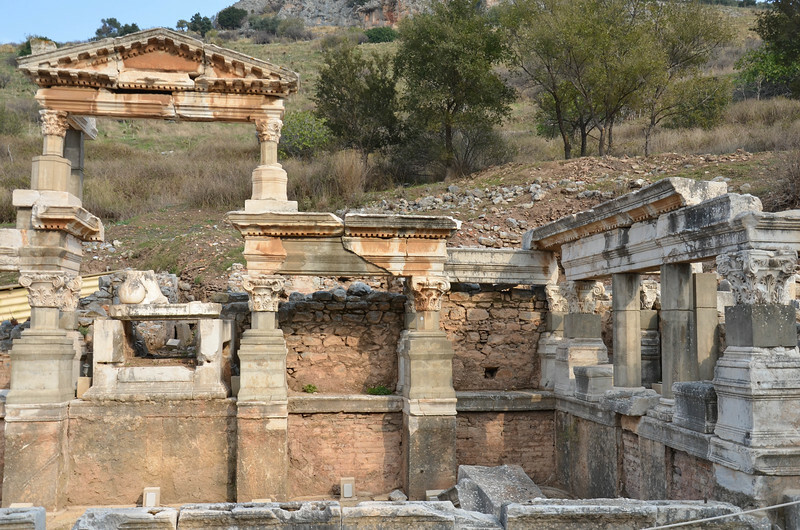 Ruins in the Baths of Scholastic complex. 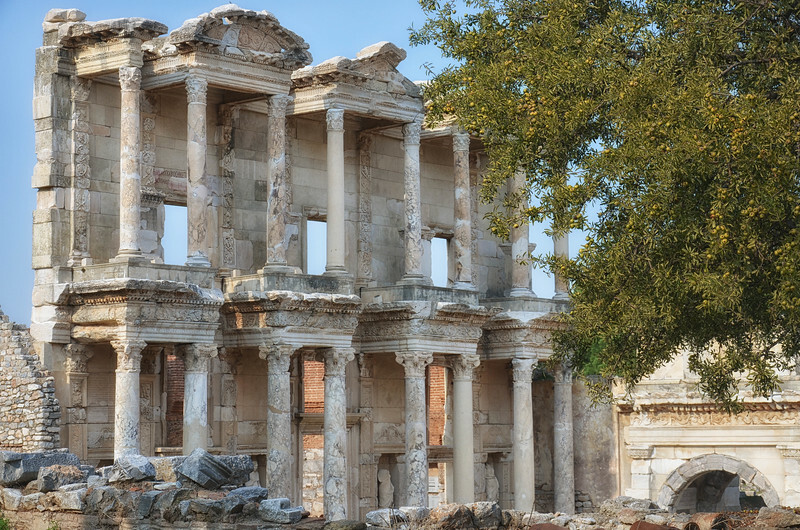 The Library of Celsus, as seen from the Baths of Scholastica. 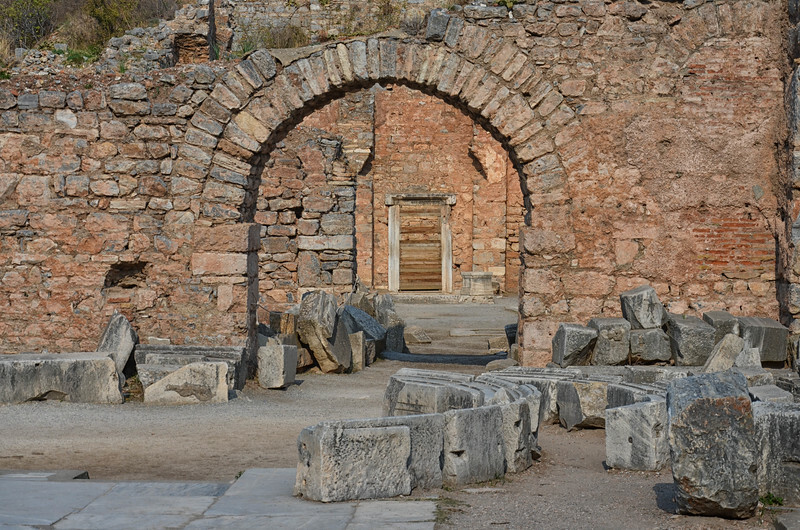 The Baths of Scholastica complex. 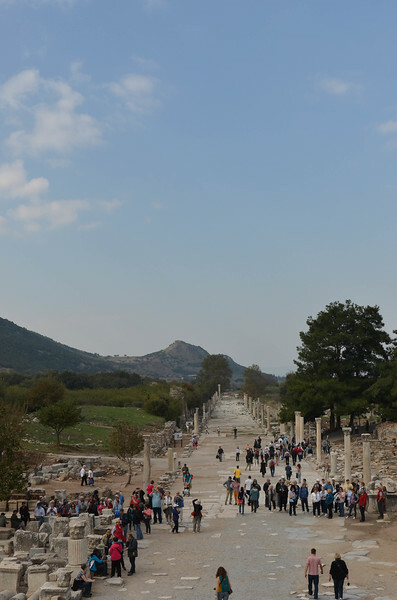 The public latrines are visible to the left of the center of the photo. 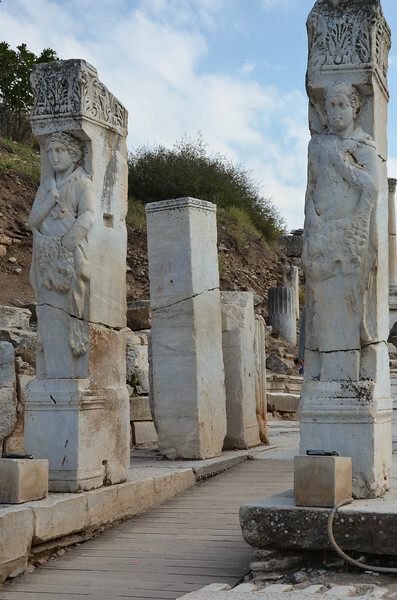 Columns in the ruins at Ephesus. 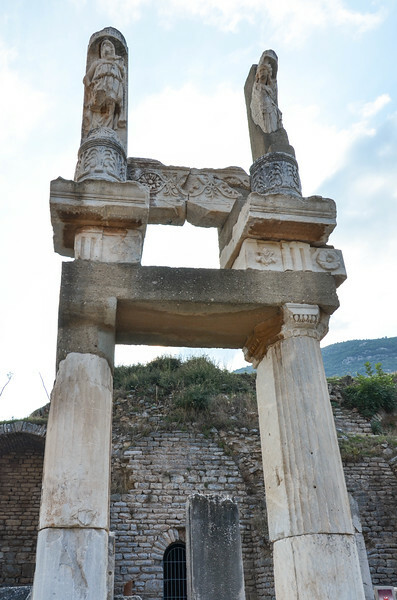 Domitian Square and the Temple of Domitian. 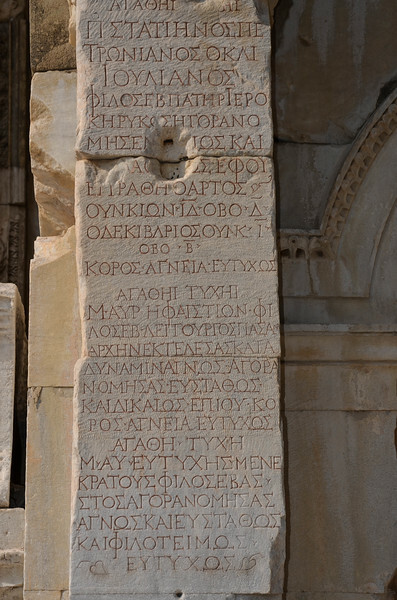 Inscriptions in the marble at Ephesus. 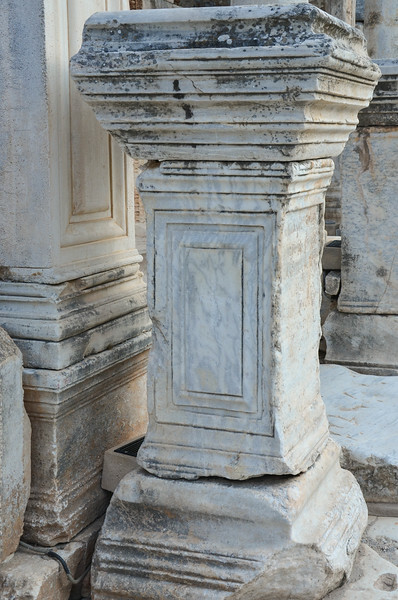 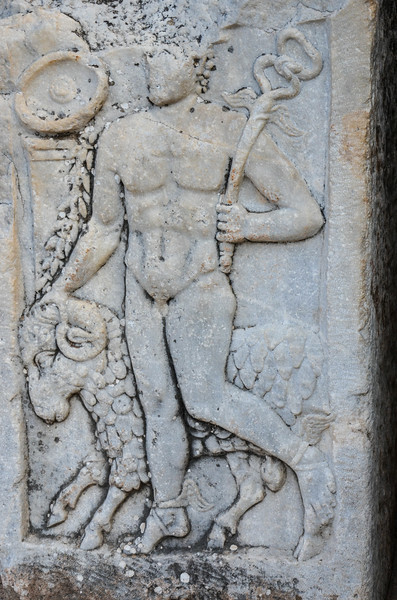 One of the many carvings in the marble in Ephesus. 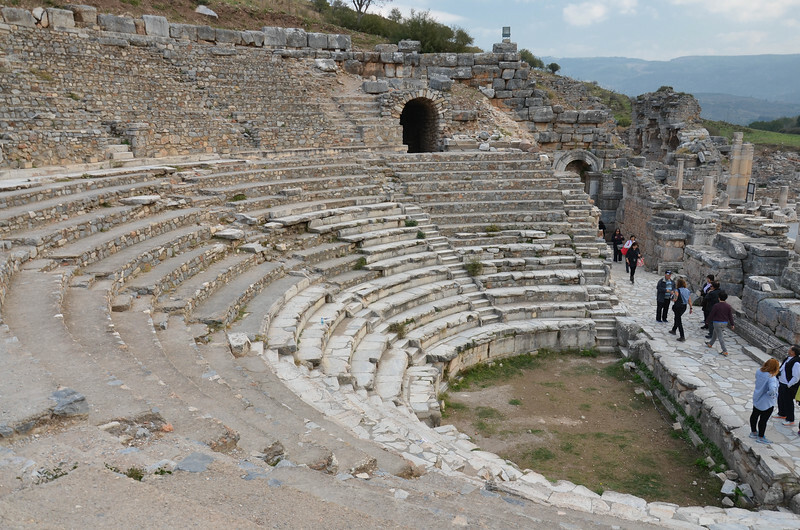 The Odeon, or smaller theatre, in Ephesus. 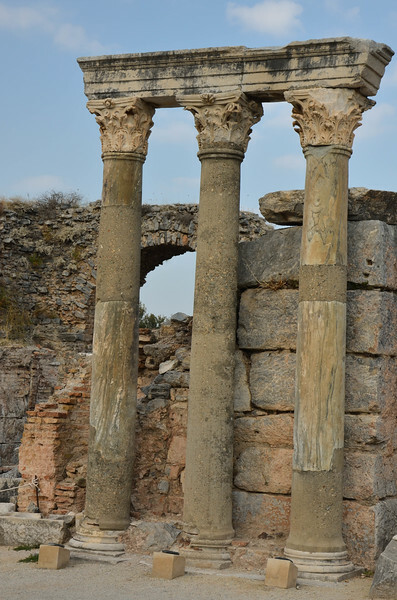 Ruins of the Basilica of St. John. 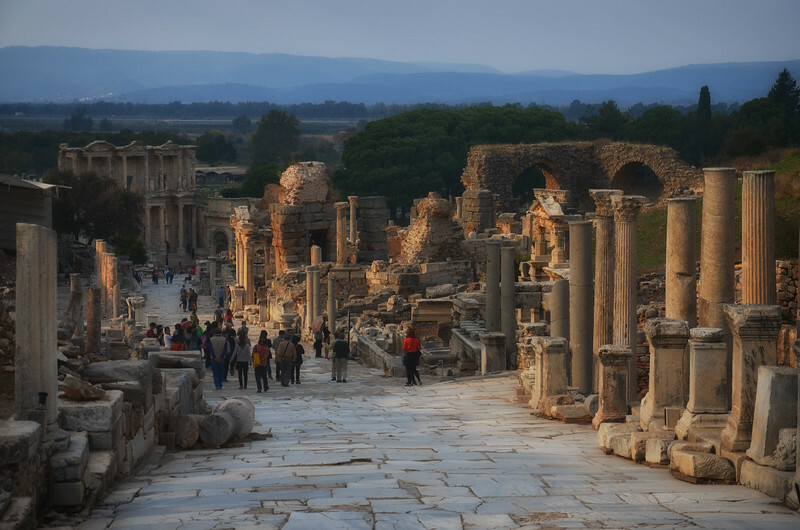 Looking down Curetes Street toward the Library of Celsus and Gate of Augustus. 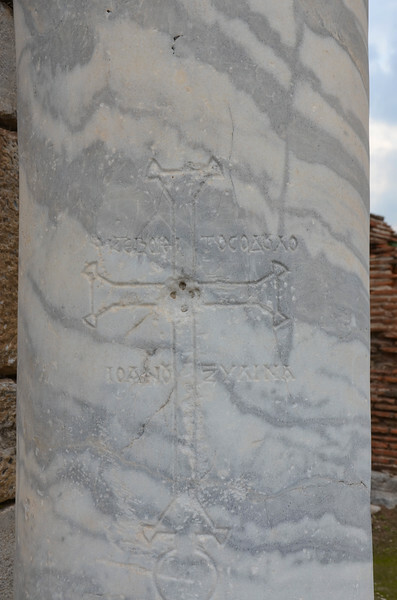 Carving on one of the marble columns at the Basilica of St. John.